If you want a little bit extra storage space, but want something that also have a very attractive look, then the Hartwood FSC Garden Chest would be just perfect. This is a storage chest that can store many items for you, but it does not require a whole lot of space. 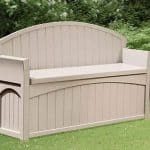 Even those whose gardens are of a smaller size or those of you with a large garden that already has a ton of stuff will be able to fit this in. 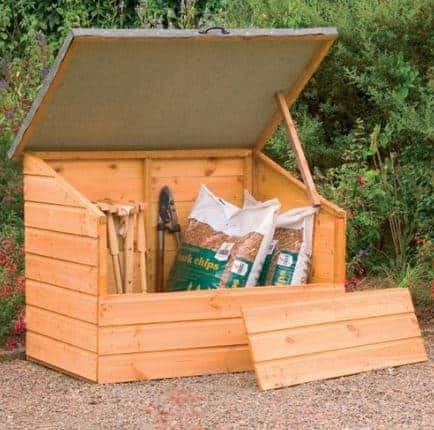 As well as offering you storage space, the garden chest has a very nice design so you are really going to like having this in your garden. From the first picture, you can clearly tell that this is one very well made garden chest. 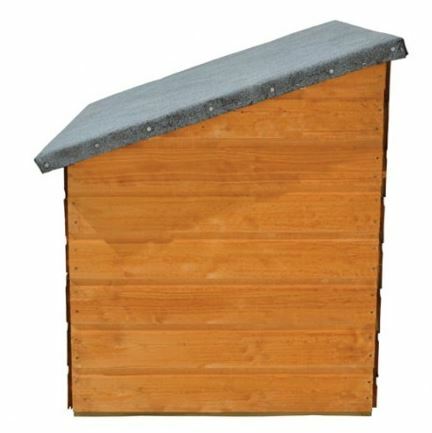 The cladding is just incredible as it is not only very smooth, tongue and groove shiplap cladding, but it is also a very impressive 12 mm thick. To go along with the gorgeous and strong cladding is a 28 mm x 28 mm frame that makes this one of the most robust and long lasting garden chests you can buy. The removable front panel is going to make getting things in and out of the chest very easy and it also gives it a very unique look. 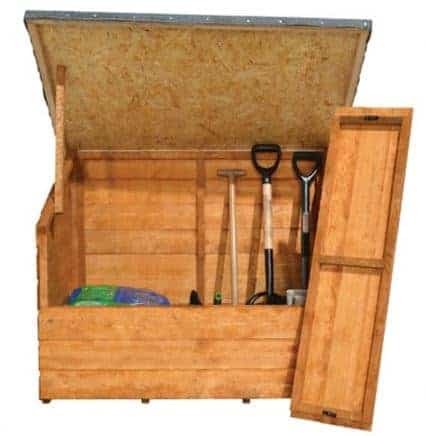 The Hartwood FSC Garden Chest is a great way to give your garden that little bit extra storage space you require. This chest has a truly fantastic look which will make stand out in your garden in a very positive way. We really love the smooth look of this and we are sure that you are really going to enjoy having this extra storage space to keep things like tools, toys and other items safe from the weather and from cluttering up your house and garden. This is a fairly decent size with the width of the chest being 4 feet 1 inch, and the depth 2 feet 8 inches. At its highest point the chest is just over 3 feet high which we feel is the ideal height for something like this as the last thing you want to do is throw your back out trying to get something in or out of a chest that is too high. The top of this garden chest is done in a pent style to keep water from sitting on top and to also give you something to shout at the kids for jumping off. This is one very well made top as they have used some good sized, solid sheet boarding and then covered it with sand felt. 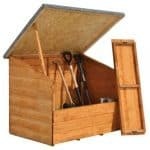 We are actually very impressed with the overall quality of the top of the chest and feel that it is certainly going to keep the rain from getting inside and wrecking all your stuff. 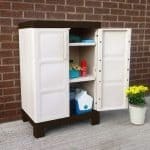 If we had to pick one feature of this garden chest that really impressed us and made us say wow then it is the cladding. They have used 12 mm thick tongue and groove shiplap cladding which to be honest with you is pretty amazing. We have seen full blown sheds that do not use cladding this thick so for them to go this extra mile here is something we really like. As strong and water resistant the cladding is, we also really love the smooth and elegant design of it and are sure you are going to love having this as part of your garden. To go with that strong cladding they have used a robust 28 mm x 28 mm frame inside the chest. This makes the garden chest incredibly strong and something that is going to last many years and actually be able to take a bit of abuse from you throwing tools inside, the weather giving it a beating and the kids using it as some kind of base. The same type of boarding has been used for the floor as for the top. This is solid sheet boarding and it is more than strong enough to take the weight of tools, gardening equipment and other heavy items. 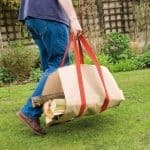 If you are someone who is big into gardening then this is going to even be able to handle heavy bags such as fertilizer. If you want to ensure that shiplap cladding stays looking smooth and awesome then you will have to give it a coating of wood treatment. The chest will be given a rather basic basecoat treatment to protect the wood during transport, but a proper coating should be applied within a couple of weeks at the most. Once a year you should give the chest a fresh coating so that rot does not appear. You will be given a very generous ten year anti rot guarantee, but as is the case with their other products, this guarantee is only valid if you have treated the wood. We have already talked about the top of the Hartwood FSC Garden Chest which does serve as a door as this lifts open and is held in place with a piece of timber. It actually opens very high so you will have no trouble getting your things in and out. This alone would be great, but they have gone the extra mile and made it so one of the panels on the front can be removed. This is very easy to do, gives you even more room to put things inside and it clips back on and still leaves no nooks or crannies for water to get inside. 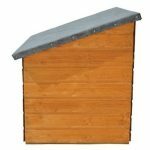 This garden chest does not come with any windows which is something we are actually pleased about as we love the way that smooth cladding looks. 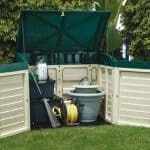 This is one very safe and secure garden chest and honestly we have no complaints at all over the security it provides. We know that some of you may be concerned with that removable front panel, but actually when you look at the chest, unless you know about the removable panel, chances are you would not even realise it is there as it clips back on so well that you cannot really see it. The top does close very well, but there is no locking mechanism included so you may want to get a padlock. 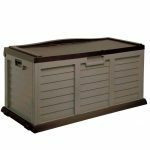 With the top down and the front panel in place this garden chest keeps your belongings completely out of sight. There is no worries about nosey neighbours being able to see what you have or potential thieves being able to walk past your garden and see all the amazing stuff you have inside of here. We really love the smooth and sleek look that this garden chest has so we really would not want to mess with the look of it so we would use a clear wood treatment. However if your garden has a particular theme or general style then you could always give this a coating of paint to make it go with the other things you have in your garden. The only thing that we suggest you give some thought to adding is a padlock. You can pick up a padlock, along with a hasp and staple, at most pound shops so this is not something that is going to cost you much money or be hard to install. 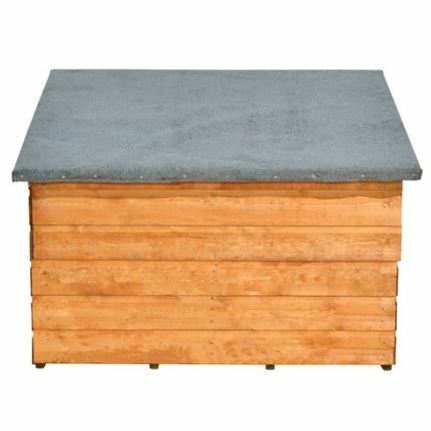 This is one very high quality garden chest and we love the high quality framing and gorgeous cladding. This is going to be taking care of your storage needs for many years thanks to the very impressive way it is made. These materials are very high quality and will stay strong for lots of years and as long as you take care of the wood it will stay rot free. This is not the smallest garden chest we have ever seen, but at the same time it is not what we would call large. Still as long as you do not just throw things inside here, you will be very surprised at how many things you can fit inside here. Even a person with let’s just say very modest DIY skills will be able to put this together without any fuss or broken or cut fingers. We feel that the price they are asking for this is very fair, especially considering how great it looks and how well made it is. Final Thoughts: The Hartwood FSC Garden Chest is something that we are very impressed with. From a storage point of view even though this is not large, you still can fit many items inside of here. 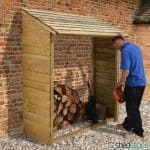 While we love how this provides our garden with extra storage space. We must say that this is one of the most gorgeous looking garden chests we have seen. That cladding is so smooth and sleek that you will want to run your hand over it every time you walk past. The asking price is very reasonable as the chest is well made and will last many years. If a little bit extra storage is what you are looking for then we highly recommend this garden chest.